In Finland, Helsinki University Hospital’s Virtual Health Village is a prime example of bringing healthcare directly into the hands of its patients. There is nothing more important than our health, and the health of those we care about. When an illness does strike, fear and a loss of control are often the first emotions that surface. Through technology and a shift in healthcare however, it is possible to empower patients and let them regain control. Healthcare is at an inflection point. An aging population and a rise in chronic illnesses, coupled with shortages in healthcare practitioners, is putting increasing pressure on public resources. This disruption is seen in how the healthcare industry engages with citizens before they become patients, how patients are monitored and cared for at home, how clinicians collaborate with each other, and how enabling earlier diagnosis is saving lives. These challenges are being felt by healthcare agencies across Europe. Today, the average life expectancy in Europe is 78.5 years, and technological advances are revolutionising medicine. We are on the cusp of a medical revolution, lead by cloud computing, data, and artificial intelligence (AI). 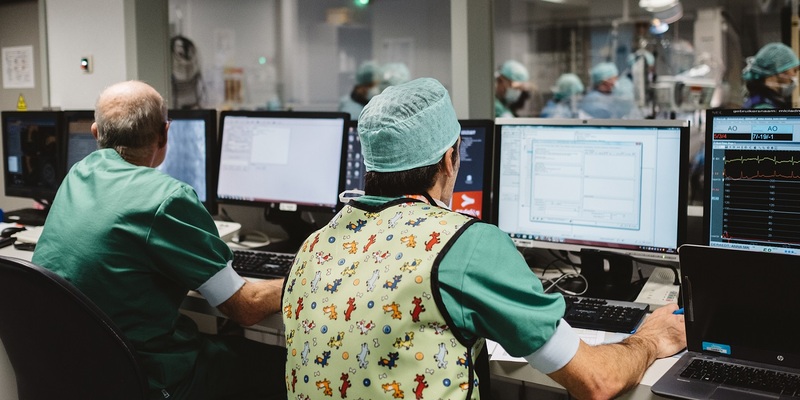 Working closely with various partners and healthcare professionals during their transformation gives us a unique opportunity to ask them to share their most important learnings and insights, as well as the latest trends in healthcare technology. We hope you find the below insights useful, and we’d love to hear your thoughts and experiences on Twitter – just tag us with #MicrosoftHealthcareStories to keep the conversation flowing. Charles Alessi is the Chief Clinical Officer for HIMSS International, an NGO focused on improving healthcare through technology, which hosts the world’s largest health conference each year. This increased focus on patient needs is an interesting one, as it involves looks at healthcare from a different angle. Alessi uses millennials as an example. They lead healthier lives, and are less likely to excessively drink or smoke. However, they are more likely to have mental health issues, which has increased the importance of non-health determinants, such as their jobs, or stress levels. Alessi believes the role of a physician must change from that of a person who simply tells a patient what to do, to someone who accompanies them on a life journey. This will require different skills – particularly communication – which can be a challenge, given that the best doctors may not be the best communicators. Alessi thinks that the healthcare sector should look beyond pure academic credentials to ensure that good physicians can also communicate with their patients in a way that makes things easier to understand, and encourages patients to correctly look after themselves. The Karolinska University Hospital in Sweden has a very fitting example of extra attention being paid to patients – a friendly robot is being used to significantly reduce the stress of children suffering from cancer. 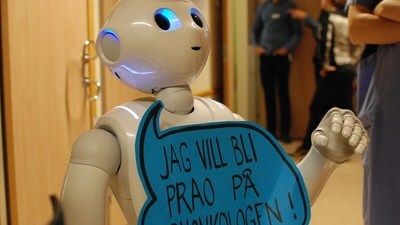 The robot itself doesn’t add any medical procedures to the existing treatment, but its friendly demeanour and in-built screen with games designed to inform children of their treatment procedure ahead of time, has proven to be a great help in reducing the fear of these young patients. In addition, the robot also helps reduce the stress of parents, and saves healthcare experts both time and money, by reducing the amount of time and people required per treatment session. Putting patients first should provide them with newer tools to not only make their lives easier, but to also provide a more personalised level of care. Virtual hospitals provide a convenient, easy to use experience which allows patients to track their health and communicate with health professionals remotely, from the comfort of their own homes. This saves patients time, and travel, which is particularly beneficial for the elderly. The online cloud service, based on the Microsoft Azure and Dynamics 365, provides information and support including medical care for patients, and tools for healthcare professionals. Patients have access to virtual buildings dedicated to different life situations and symptoms, such as pain management, rehabilitation, mental health, and weight management. Empowering patients and putting their own healthcare within their control, is key. The kidney disease app in the Virtual Health Hospital shares real patient experiences and how they are coping with their treatment, to help other patients feel that their disease is manageable. Patients are more likely to listen to people going through the same experiences, and this genuine relatability helps morale, while increasing the chances of them correctly following their treatment plan. In Scotland, technology is bringing personalised care to patients suffering from Chronic Obstructive Pulmonary Disease (COPD) – a condition which affects 1.2 million people in the UK, and is the second most common cause of emergency hospital admissions. Without treatment, the symptoms (which include breathlessness, chest infections and a persistent cough) get worse, but a new trial brings an easier way to manage the illness to patients, from the comfort of their own homes. Patients use wearable devices combined with Microsoft’s Azure cloud platform to remotely monitor their breathing. AI algorithms, based on machine learning, are then used to monitor results, and automatically detect and predict issues, so that healthcare experts can vary their treatment accordingly, based on their individual needs. This not only saves patients from making regular trips to the hospital, it also means that if their condition gets worse, their healthcare providers will automatically be alerted, allowing timely treatment, and a better quality of life. In another corner of the world, one of the oldest diseases known to mankind – leprosy – is being treated with AI. The Novartis Foundation and Microsoft are developing an AI-enabled digital health tool and a Leprosy Intelligent Image Atlas to help the early detection of leprosy. Over 200,000 people are diagnosed with leprosy every year, with Brazil, India, and Indonesia accounting for about 80 percent of new cases. The disease is made more complicated by the fact that it can be difficult to diagnose, and if left untreated, can cause other disabilities and spread to others. Microsoft and the Novartis Foundation are collaborating with local investigators from Oswaldo Cruz Foundation (Fiocruz) in Brazil to develop a machine learning algorithm which examines anonymized images before automatically detecting if a patient has leprosy. To save patients (who are often in remote rural areas) from travelling long distances to hospitals, they are able to instead visit local businesses and have their photos taken there, before the shots are examined by the AI programme. The imagery and AI code are planned to be made publicly accessible at a later stage to empower leprosy researchers to accelerate research excellence in this field, leading to better outcomes. None of these healthcare advancements would be possible without the combined power of data and the cloud. Juha Tuominen, MD, PhD, CEO HUS Helsinki University Hospital believes that the most important healthcare vision that needs to be fulfilled, is the unification of healthcare services into one overall platform. Currently, he describes that while patients can visit the Virtual Hospital, receive post-care questionnaires, book appointments and pay bills through online services, they are running on different platforms. “My first vision is that the whole chain is seamless, through one platform which combines all of these specific aspects. For a patient, it must be one journey,” says Juha Tuominen. Data is the fuel needed to drive these healthcare platforms, and with it, the issue of privacy and security is paramount, as healthcare data contains some of the most sensitive, individual information available. There is more work to be done to increase the voice of the patient in healthcare design, and the patient community is willing to engage. From Microsoft’s point of view, the security and privacy of patient data is crucial. “There is no way we can reimagine healthcare without trust as a gatekeeper,” says Elena Bonfiglioli, Microsoft Healthcare Lead Europe. Ultimately, beneath these new technologies and solutions, are the people, the patients. The driving force behind these changes is their profound impact on often vulnerable individuals who are going through a tough period in their lives. Allowing patients to empower themselves with their own care, from their own homes, while encouraging healthcare professionals to focus more on their needs, provides a much-needed sense of security. Practitioners can use technology to do what they can do best – provide care and prevention – helping patients feel better, while in other cases, helping prevent problems from arising before they even happen. From focusing on more empathetic physicians, to helping children feel better with robots, or letting patients hear similar experiences from other people to build a sense of community – the future of healthcare looks set to make the lives of both patients and their doctors, better than ever before.